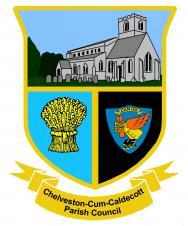 In December 2009, following sampling of a small number of the community, the Council agreed in principle to adopt a logo or crest, subject to wider community input in the design. Accordingly, in the 2009-10 Parish Appraisal, views were sought from the parish on three sample designs, along with an option to submit their own ideas. The main themes that emerged were the Parish Church of St John the Baptist, the close association with the 305th BG, USAAF (who operated out of RAF Chelveston during WW2) and the rural, quiet nature of the parish. With the help of Spurcroft-Civic who undertook the artwork, a shield design, with the Council's name below, was chosen to hold the images or icons. The church was chosen to occupy the upper part and several designs/views were considered, whilst taking care not to copy an existing design used by the Parochial Church Council. A design adapted from one submitted in the Parish Appraisal was used, being the view seen from the south-east corner of the churchyard. The rural or agricultural nature of the parish is represented by the wheat sheaf, a common symbol in local heraldry (East Northamptonshire Council uses a corn sheaf in their crest to symbolise the farming heritage of the district). The background colour went through several changes until the blue was chosen. There was support for both the 305th BG wartime logo and the new 305th BG memorial — effectively the historical and the modern images — and so the parishioners were asked to vote in the Parish Appraisal. The historical version received 50% more votes and was duly "elected". The 305th BG Memorial Association were consulted and at their Annual Reunion/Convention in New Orleans in September 2010 confirmed that they would be honoured for their wartime logo to be incorporated into the crest. The USAF Historical Research Agency at Maxwell AFB was also consulted to ensure that there were no copyright issues. The crest was first used on the Council minutes of the October 2010 meeting and then progressively spread to the Council's letterheads and the website. 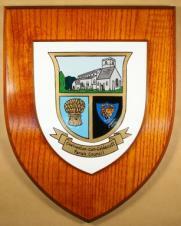 A hand painted version of the crest hangs in the village hall, which was donated to the Council by the Clerk in December 2010. In celebration of 15 years service to the Council in February 2017, the Clerk donated a sterling silver badge of office, based on a miniature of the Council's crest, for use at civic occasions. 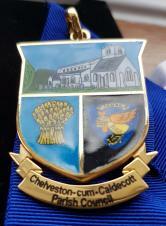 This was first presented to the incoming Chair of the Council, Cllr Ray Daniells, by his predecessor, Cllr Liz Kelly, at the 123rd Annual Meeting of the Council in May 2017.